PinHawk classified ads can help your firm find experienced talent. Promote seminars, webinars and other events with PinHawk classifieds. Target job postings to thousands of law office professionals. Your firm can include important job postings in our classified sections. The section will include a link for each of your employment placement ads. Your organization controls the links and the link texts. Your firm will find needed expertise while our subscribers can enhance their careers. PinHawk�s Law Office Management publications provide a cost effective way to reach the employment prospects you need. 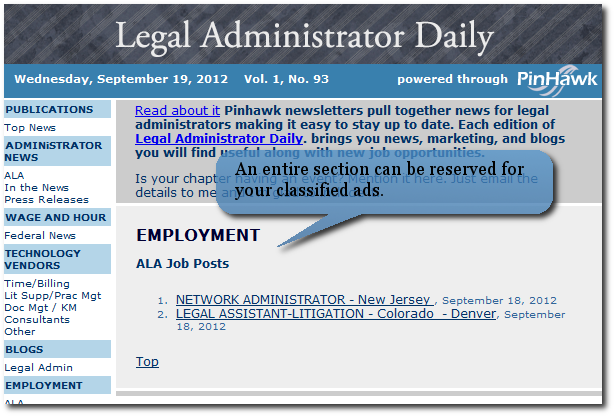 > Learn how PinHawk Classified Ads can work for your organization.